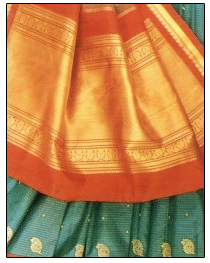 Kanchipuram is famous for its silk sarees. The USP of these sarees is that each thread is made up of three silk fibres twisted together, making the cloth more durable, and of course costlier, compared to that from other weaving centres. None of the raw materials that make go into the making of these amazing sarees is local; the mulberry silk yarn comes from the neighbouring state of Karnataka, the metallic yarn (Zari) which is interwoven with the silk to give the metallic look comes from Gujarat, and none of the dyes are manufactured locally. But all these materials are brought here, and the skilled artisans weave these sarees on handlooms, each saree becoming a unique hand-made work of art, six yards of magic! Cotton sarees are also made here on handlooms. Kanchipuram sarees are world-famous, and a treasured part of every South Indian bride's trousseau. They also make good gifts, are available in various colours, and with different price tags. The only difficulty for many ladies is knowing which sarees to select, and when to stop! Happy shopping, and happy bargaining! Copyright @ 2009. www.kanchipuram.com All Rights Reserved.